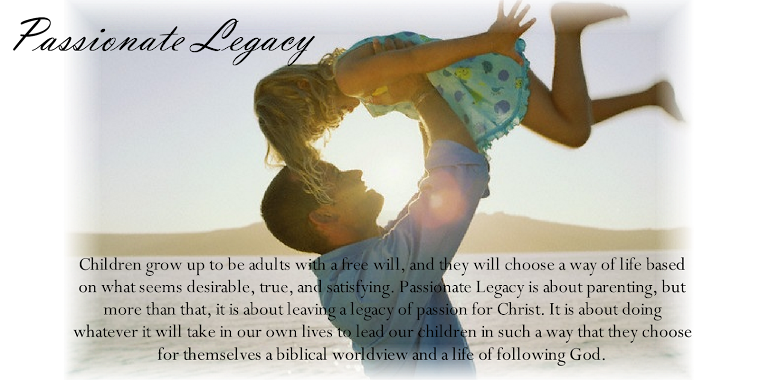 New Passionate Legacy Document Downloads! You will notice on the right, there is a new section on the Passionate Legacy web page called Helpful Document Downloads. Periodically, we will be posting items that we have found useful to print and put up in our house. There will always be two versions of a document, an MS Word version (which can be edited), and a PDF version (use this if you don't have Word on your computer). 1. Go to the person you are angry with (or who is angry with you), and tell them that you would like to talk to them. 2. Identify the problem or issue clearly and concisely. If it was an offense against you, state “in terms of behavior” the offense and how it made you feel. Avoid name-calling, keep a calm tone of voice, and attack the problem not the person. 3. Allow the other person to give their side of the story or perspective on that issue. 4. Try to admit what you did wrong in the situation and “own” your part of the conflict. 5. Each person ask for forgiveness for their own part in the argument. 6. Each person agree to forgive the other. 7. Together, come up with an action plan for avoiding this conflict in the future. Each one commit to this plan and say what they will do differently from that point on. These should be posted in a conspicuous place in the house and teens should be invited to use these with each other and with the parents, and parents should use them with teens and with each other as well. Note that in step 2, you are to identify the offense “in terms of behavior.” This is in contrast to a “characterization of personality.” Listen to the following: “Why are you always so rude! ?” “You are being a pest!” “Why are you such a slob! ?” Contrast these statements, which make characterizations, with the following alternatives: “When you spoke to me in that tone of voice, it sounded disrespectful,” “When you make those noises while I am trying to read, it really bothers me,” “Please pick up the mess you left on the table and floor of the dining room.” These last three statements address a specific behavior and will be more readily received than any blanket statement of personality or name-calling. This way of speaking will help in any relationship (marriage, coworkers, etc. ), but it is HUGE in parenting. It breaks my heart when I hear a parent calling a child a name: sloppy, lazy, dumb, stubborn, etc. Name calling condemns the other person and may become a self-fulfilling prophecy, whereas addressing the specific behavior gives the person hope because they know exactly what they can change to make the relationship better. Many people talk or write about “Phases of Childhood,” or “Stages of Development” for children, and these are important to understand. They deal with observing and understanding the changes that take place in the growth process of a child. But it is arguably more important to understand the “Phases of Parenting” since these deal with applying changes in our goals and practical strategies for dealing with our children in a way that best fits their age. These deal with application rather than just observation. Friendship is not the starting point of parenting, it is the eventual result. Before a healthy friendship is possible, parents must work through three relational building periods with their children. The success of each phase is largely dependent on the success of the preceding phase. Phase one: Discipline, 0-5 yrs. In this period, you are establishing your right to lead and building the foundation for obedience. Your leadership is not oppressive, but it is authoritative. You must be fully confident in your right and responsibility to lead and give direction. You are in charge. If you cannot control your child, your cannot train him to his full potential. Tight boundaries are to be maintained and first time obedience is to be expected. Children will test those boundaries, but if they find the boundaries of the home secure, it will add to their own sense of security and respect for your leadership. Some of those boundaries will be expanded based on the child’s demonstration of responsible behavior. But you will only be able to hand off the authority that you gained in the younger years. If you have not gained authority in the younger years, your child already has that authority in their middle and teen years and will not be willing to allow you to make any decisions for their safety, protection and moral well being. Phase two: Training, 6-12 yrs. A trainer works with an athlete through teaching, exercises, drills, and post-play evaluations. During practice, he stops the player at various times to make corrections, give explanations, and show the proper way and reasons for certain techniques, moves and plays. When it comes to rules, you are teaching the moral reasons behind the rules and the biblical principles by which we live. They also need to know that you are subject to rules as well, because they are based on eternal truths and absolutes. They should begin to realize that your authority, which was established in phase one, is based on and subject to the higher principles of God’s orderly universe and what He has instructed us in Scripture. In this phase, kids begin to make many of the day to day decisions, choosing from options offered by the parents. Freedoms in those decisions (e.g. friends, leisure activities, restaurant menu choices, clothes) are given at a pace commensurate with responsibility (obedience, chores, homework). Phase Three: Coaching,13-19 yrs. This is a phase when many parents try to assert more authority and stricter boundaries, often in response to the natural pushing for freedom that teens exhibit. But your role at this stage is to begin to transfer responsibility to your teens so that by the time they are adults, they are fully responsible for their own lives. In non-moral areas, teens should be allowed to exercise more freedom. In other, more significant areas, teens should be given more freedom based on their level of responsibility. This “freedom based on responsibility” should be clearly explained. Teens should be made aware of the very important principle that increased freedom, comes from earned trust, which comes from making good choices. There are things that are privileges (sleepovers, use of a car, time with friends, personal electronics, fun activities … these are not inalienable rights) that can be earned by being cooperative and responsible (getting up on time, keeping good grades, honoring curfew). These are also years when many parents feel that their teen would rather not spend time with them, so at first, they accommodate and spend less time with their kids. But this lack of nurture for the relationship leads to distance and even a sense of abandonment. The teen then responds to the distance and sense of abandonment by acting independently, at which point the parent all of a sudden grasps for that parent-child relationship often in unfruitful ways (e.g. trying to assert more authority). The nurturing of the relationship should be a priority throughout this phase and a parent should carefully guard against this tendency toward emotional or relational abandonment. Phase four: Friendship, age 19 and up. Friendship is the relational goal of our parenting. We are adult friends with wisdom and more experiences and they can ask for advice, but we are not their authority. We can offer advice, but they are not obligated to take it. Some parents continue to try to exert an inappropriate amount of influence through subtle and manipulative ways. This is self-serving and sabotages the transition of the adult son or daughter into a responsible, productive and secure adult. In the transition from each phase to the next, we much carefully consider our goals as parents and thoughtfully and prayerfully adapt our strategy and actions to effectively fulfill the appropriate role (disciplinarian, trainer, coach and friend). What respect can you expect when you’re expecting? Q: My husband and I have a question about our son’s behavior lately. He is three years old and it seems as though he is having trouble listening, following directions, and first time obedience. He seems more whiney and tends to get frustrated more quickly than usual. It's only been the last couple weeks. We want to know if this behavior is related to the fact that we are expecting our new baby in about 4 weeks. My husband’s parents and sister were out for a visit last week and she has a baby. Our son did very well with her. He wanted to help and was good about sharing his toys and very sweet to her. We just wanted to get your opinion about this. Thanks! A: There is really no way to know if or how much your son’s change in behavior has to do with your soon-to-arrive-addition-to-the-family. There are other changes going on in your son’s life, aside from that new bundle of joy. At about three years old, and several other times in the life of a child, they will reevaluate and re-test all the of boundaries that they have accepted up to that point. That sounds like bad news, but this is a natural part of the cognitive (brain function) development of a child. The important thing for us to remember as parents is that when our children reach another point of re-testing those boundaries, we must show them that the boundaries are real and firm and will be enforced. The beauty of each stage is that it is an opportunity to explain, on an even deeper level, the moral reason behind those boundaries or rules. Be strong. You are the parent. You are in charge. Be firm in reminding him that he will obey when you ask him to do something. Keep your word. Don’t make empty threats. Follow through immediately with discipline. Younger children are very good at learning first time obedience, it is often the parent’s enforcement that is lacking. The child is testing that, and if you let up now, it will be the first step down a road that leads to an anarchic disregard for authority. In a few years, he will be getting bigger and more difficult to physically handle, so it is important that he has a clear idea in his mind of who is in charge. I would also like to suggest that you do some specific things that show him that although you now have to focus on a new child in the house, your love for him is as strong and full as ever. 1. Tell him several times a day how much you love him and how important he is to you. Look him right in the eye and with a big smile ask, “Do you know how much I love you?” and see what he says. 2. Get a special gift and give it to him right about the time he sees all the gifts for the new baby. 3. When you put the baby down for a nap, take a few minutes to play with him. Resist the temptation to jump on the dishes or housework right after putting the baby in her crib. Read him a story, get out the blocks, get on the floor and play legos with him. Take 10-15 minutes to fill up his love-tank, so he remembers how important he is to you. 4. Try to never use your care of the baby as a reason for not spending time with him. Instead of saying, “Mommy can’t play with you right now, I have to feed little sister,” say, “Mommy will play with you in a little bit,” and then follow through on your promise. 5. Feel free to include the older child as much as possible in the care of the younger child, but never force it. If he wants to hold little sister, show him how to do it safely, but if he doesn’t, don’t force it. Bottom line: give him time, attention, affection, and as much discipline as needed.